September 07, 2018 at 10:38 am. No. 17-ranked USC may have been preparing for its season-opening tilt against UNLV last week, but that did not keep some Trojans from sneaking a peek at the Friday night telecast of Week 2 opponent Stanford in the No. 10-ranked Cardinal’s 31-10 rout of San Diego State. 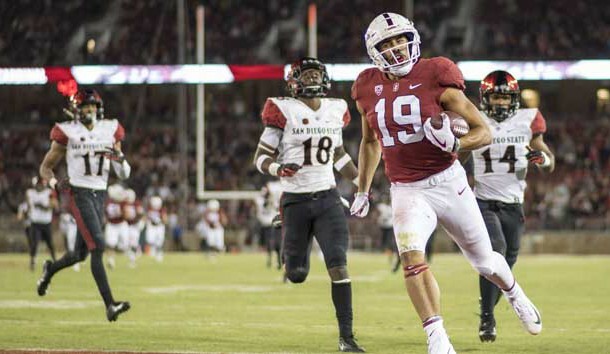 Standing out was Stanford wide receiver J.J. Arcega-Whiteside, whose 226 yards receiving and three touchdowns on six catches more than compensated for a 29-yard output from 2017 Heisman Trophy finalist running back, Bryce Love. “That’s their guy. We know they’re going to go to him for the fade ball,” said USC defensive back Ajene Harris, whose Trojans face Stanford on Saturday at Stanford Stadium in Stanford, Calif. “Whether they go to him for the fade ball or over the back shoulder, we’ve got to prepare for it. USC knows firsthand of Arcega-Whiteside’s explosive capabilities. He caught passes of 42 and 45 yards against the Trojans in last December’s Pac-12 Championship Game, the latter of which set up a late Stanford touchdown that brought the Cardinal within a field goal. His two outings since then were the best of his career, as his Week 1 effort — which garnered Arcega-Whiteside Pac-12 Offensive Player of Week — followed another three-touchdown performance in last year’s Alamo Bowl. While Stanford still has one of those sizable tight end targets customary of a Cardinal offense — 6-foot-7 Colby Parkinson caught a touchdown pass against San Diego State — the emergence of quarterback K.J. Costello has provided the catalyst for this to be more than just a Love-focused attack. The layered look that coach David Shaw’s bunch rolled with in Week 1 came in direct response to San Diego State stacking the box in response to Love. The Aztecs were more effective than any opponent has been against him, denying Love any of the big plays that highlighted his 2,118-yard 2017 campaign. In committing to limiting the explosive play on the ground, San Diego State became susceptible to the big play through the air. Such is the balance USC defensive coordinator Clancy Pendergast must solve Saturday, but Helton notes that limiting Stanford’s effectiveness with four-to-six-yard gains on first and second downs is just as vital. Big plays were the most glaring issue for the USC defense in Week 1, with UNLV scoring on a 71-yard Lexington Thomas touchdown run, and 31 of Armani Rogers’ 97 passing yards coming on a scoring strike to Kendal Keys. The Rebels built a first-half lead on the strength of those long touchdowns before a USC offense quarterbacked by true freshman JT Daniels settled in and answered in a 43-21 win. Daniels’ presence behind center presents the Stanford defense with as much of an unknown as a team can expect from an opponent it’s facing for the third time in 12 months. But while the tendencies of the Trojans offense with Daniels at quarterback have yet to become evident, Shaw knows the young quarterback’s potential. Daniels found success in the second half of Week 1 in a manner similar to Costello, unleashing a few deep balls. His first collegiate touchdown came on a 43-yard pass to his former high school teammate, wide receiver Amon-Ra St. Brown.